I love living in the Midwest, but there is always the time around mid-February when Christmas is long gone, but spring still seems so far away. Instead of wallowing in my misery I decided to read up on a concept I first came across in Real Simple called hygge. 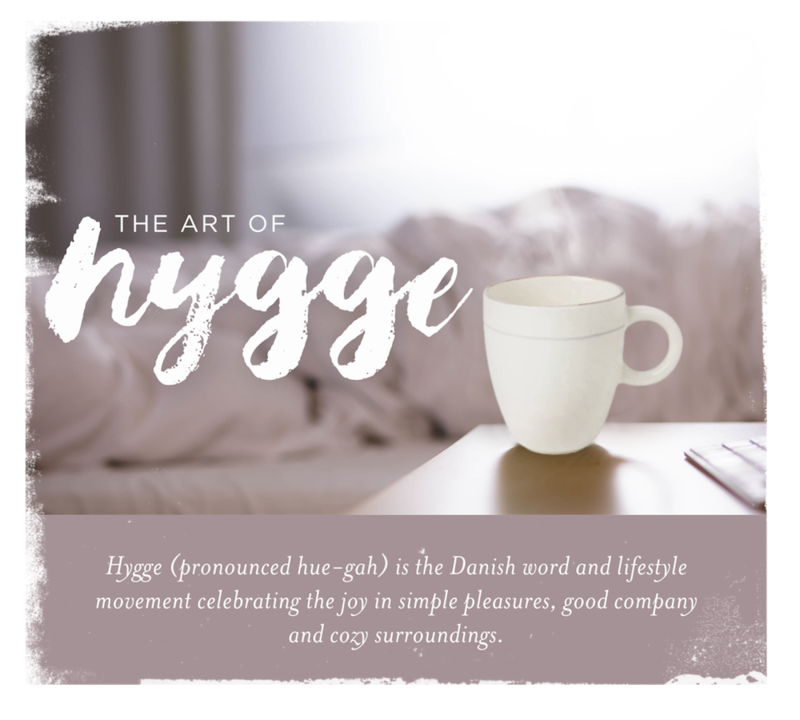 Hygge is a Danish word and lifestyle movement that emphasizes the importance of coziness, comfort and good company. According to The Little Book of Hygge: The Danish Way to Live Well by Meik Wiking, CEO of the Happiness Research Institute in Copenhagen, the foundation of hygge is candlelight, cozy sweaters, warm drinks and good conversation. Honestly, I can't think of a better way to spend an evening. I have rounded up a few (ethically-sourced) items to help you get your hygge on. For a good soup recipe check out Homemaker's Habitat - Rebecca's blog has a ton of great recipes and ideas for your gathering. Lavender Sea Salt Swirl Bark | Kakao Chocolate - $3.50: Delightful mix of milk and dark chocolates sprinkled with sea salt and lavender. A great way to treat your soul. Orange + Clove Candle | Slow North - $34: Create a welcoming, peaceful environment with this blend of orange, clove and cinnamon essential oils. This candle is soothing and inviting, with its warm and uplifting aroma. Brie Cocoon Cardigan | Amour Vert - $158: This is the sweater you'll want to wear every single day and layer over everything. Crafted from Amour Vert's signature Merino wool, this roomy cardigan an oversized fit perfect for lounging in front of a fire. Silky Aztec Scarf | Casa Verde - $65: This scarf is hand block printed with a mud resist on a cotton/silk blend scarf then colored with natural dyes. The silky fabric falls gracefully against any silhouette and feels great on your skin. House Blend | Metric Coffee - $12.50+: If you are anything like us, cold weather is nothing but a reason to drink more hot coffee. Metric Coffee designed their current House Blend to accompany you on your cold commute or long weekend mornings. Notes of raisins, milk chocolate and brown sugar all unite to bring you warmth and comfort as the cold season stretches on. Individual Tea Set | Casa Verde - $68: This unique tea set enhances all of life’s quiet moments. Our Individual Tea Set has an elegant matte glaze with a richly hued pot and natural white mug. Quinn Chair and Ottoman | Room and Board - $1,198: Spend hours curled up with a good book, listening to music or gazing out your window with a chair and ottoman constructed in North Carolina and built to last a lifetime. Featuring mid-century soft curves, this set is versatile and will fit in with almost any decor. Eco-wise Wool Herringbone Throw | Pendleton - $119: Snuggle up in this blanket crafted from virgin wool and woven in Pendleton's American mills. Easy-care wool gets softer with each wash and meets the highest standards of sustainability. White & Black Mud Cloth Pillow | Casa Verde - $72 This pillow pairs a modern white and black palette with an inviting texture that is right at home on your sofa, bed or favorite chair. Artfully woven and dyed by hand, and backed with black linen our vintage mud cloth pillow is a harmonious addition to your home.